SolarSheat 43 Inch Standard Replacement Wall Mount for Single Collector. 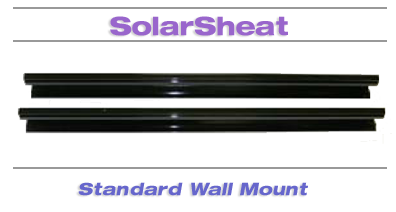 SolarSheat 43 Inch Standard Wall Mount for Single Collector. Includes two 43" mounting rails to be used for single unit installations of Solarsheat 1000 or 1500, portrait orientation only. These rails come standard with your SolarSheat Heater. Offered as a replacement part.